This is a top quality, ultra fine gauge, gate latch splicing needle (with alluminium handle) + 4 Quick Change Spare Needles. The perfect tool for making knotless connections or rigs using Leadcore, Climax Dyna Splice or other braided material and you can quickly replace a broken needle with a spare needle. 6 Quick Change Spare Needles per packet. The E-S-P stainless steel Nut Drill and matching 6mm diameter Cork Sticks are designed for drilling out Tiger Nuts, boilies etc. By altering the length of Cork Sticks used, different levels of buoyancy can be achieved from just counterbalanced, slow sinking to extra buoyant perfect pop ups. The ideal gadget for getting baits out of soaking pots - No more sticky fingers. The tool has four grabbing fingers that picks up your bait when you use the plunger. This tool picks your bait up without damaging it, holds it and then you can put your baiting tool through the bait. The gate latch head clasps and closes round loops allowing you to pull the hooklink back through sticks or bags. Handy device that features four tools in one! Robust latch mechanism to prevent snags on withdrawl. Extra Long drill ideal for large and small hard baits including microwave and air dried pop-ups and particles, etc. Easy to rotate brass barrel for speed and accurate control. 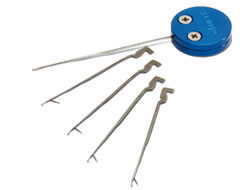 Fine gauge gate latch needle specifically designed for splicing leadcore but also ideal for delicate and small baits. Click here for more information on this product and to watch a video on Splicing Leadcore. Same as the Hair Needle but with a finer diameter shaft making it suitable for smaller, more delicate baits without splitting them. Ultra sharp point and barb makes the Mini Hair Needle suitable for use with all types of baits, nuts, boilies, floaters or large pellets. Also perfect for drilling holes in hard and brittle baits such as dry mixers and large pellets. Rig Glue dispenser with a single drop control button. Unlike most other glues our Rig Glue is odourless (non-smelling) and thus suitable for fishing. This handy little tool doubles as a skinned hooklink stripper and knot puller. It easily removes the outer coating of the Gardner 'Skins' range (and all other coated hooklinks). A relatively small, neat eye makes the Tube Threader a pleasure to use with all anti tangle tubing. Line is easy to thread if the line and the tubing are both dry, but it can be really tricky when wet. Extra long needle allows use with double baits or super sized single hookbaits and hard baits. 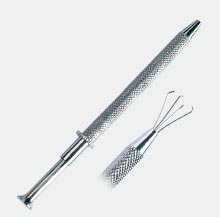 'Braid friendly' ballpoint crochet type needle retracts through the bait into the handle leaving perfect sized hair loops every time.